The following is a piece of thinly veiled fiction that I wrote several years ago and haven’t found a home for. I concede, oh great magazine publishers — it’s not for you at this time and I’m glad that you appreciated the opportunity to review it. Maybe it’s a piece of junk, I don’t know. Maybe I hadn’t quite found my groove yet. But rather than shove it in the proverbial sock drawer and forget about it I thought it might be an okay way to close out the holidays. I hope you enjoy. I straightened my construction paper and shrugged my shoulders. I fiddled with the crayons in my pencil box. We were presidents, policemen, ballerinas, and astronauts. Colleen wanted to be a veterinarian; Patrick chose acting. For the next hour we pasted colored paper, magazine clippings, noodles, and string onto sturdy manila file folders. Charles’s bore photos of Phil Niekro, Hank Aaron, and Dusty Baker pasted in a horseshoe around Chief Knockahoma. Mine looked like a tool and appliance catalogue. “I don’t think you should ask for so much, honey,” Mother said, shaking her head at the list in her hands. “He just went through the Wish Book and pretty much wrote down every toy he saw,” she sighed. My eyes burned and my cheeks tingled. Mother set the list on the arm of the green velvet couch, on top of the Wish Book. “One doll, that’s the only new toy I got when I was a little girl. A Raggedy Andy doll, and your Uncle Randy tore his arms off,” she quivered. “You going to cry, too, momma’s boy?” my father snapped. I snatched the catalogue and the list and ran to my room. “You keep it up and you won’t have a Christmas, boy!” he yelled up the stairwell. I burrowed between my Snoopy sheets and covered my ears, the Wish Book tucked beside me. On the cover a little blonde girl and her stuffed Winnie-the-Pooh, a Sears exclusive, searched for Santa through frosted windows, their arms raised in giddy anticipation. Her white-collared Winnie-the-Pooh gown, available in girl’s sizes four through eight, was set off by a big, red bow. In the background sparkled the golden lights and silver garland of a New for 1974 Natural Look and Feel Blue Cedar Christmas tree. I drifted to sleep dreaming of Brunswick Air Hockey by Aurora ($28.87, page 526) and Big Jim’s Super Safari ($11.44, page 571). I took my list out of the catalogue. I awoke to a head full of chattering voices: It wasn’t my fault they had a sorry childhood . . . . it’s okay to be unsure. . . . I got ten bucks to spend on Christmas. . . . one doll, that’s the only new toy I got. . . . you didn’t actually show them that, did you? The Wish Book still lay beside me, daring me to find a doll that was both okay for a boy and below my father’s ten dollar barrier. GI Joe looked cool, but he only cost $5.77. Evel Knievel came packaged with a stunt cycle, a violation of the “one doll, that’s the only new toy I got” mandate. Ken? A Barbie without a dress. On page 443 bright-eyed ventriloquist dummies sat in a semicircle, their faces frozen in showy smiles: Mr. Mike, the deluxe model with the built in microphone, $21.94; Charlie McCarthy, Edgar Bergen’s famous friend, set for a night on the town with tuxedo, high hat and monocle, $10.87; Blabby, plaid jacket, white dickey and slacks, stuffed body, molded hair, $9.97. 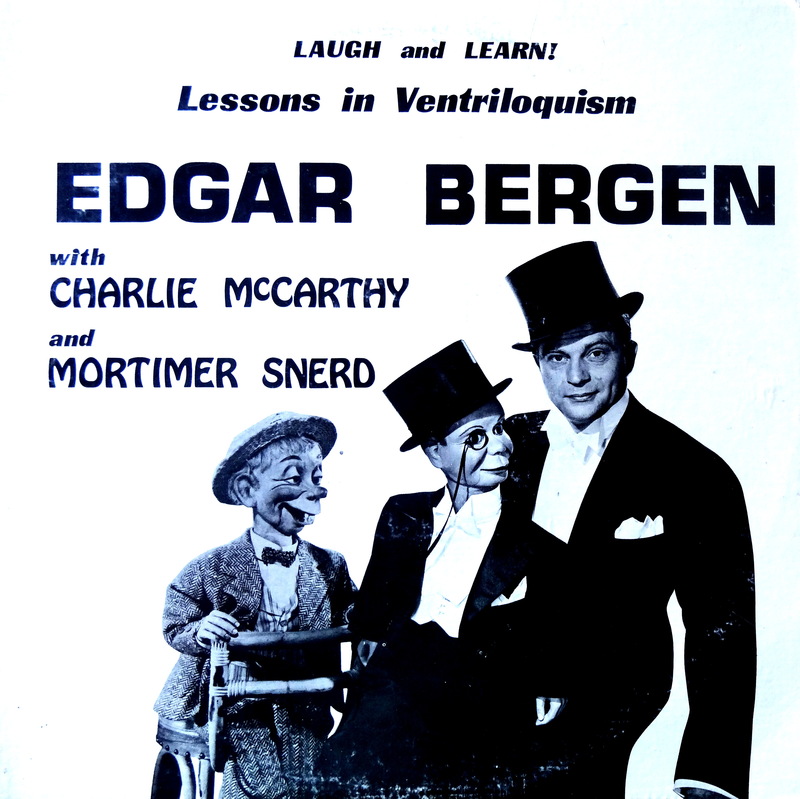 From the 1930s to the 1950s, the internationally renowned star Edgar Bergen entertained millions with his skills as a ventriloquist, “chatting” with his even better-known wooden dummy, Charlie McCarthy. In this easy-to-follow guide, designed especially for aspiring amateur ventriloquists, Bergen shares the secrets of a craft that continues to amuse and delight audiences around the world. I tucked the little book between The Complete Photo Guide to Home Repair and Forced Air Furnaces and walked to the checkout desk. “Your success as a ventriloquist will depend a great deal upon your ability to give the illusion of a human personality other than your own,” Mr. Bergen said. I repeated his words, my face frozen like a catcher’s mask. “Your face and body must express a natural, human reaction to the words of your companion in order to stress the humor or drama of his speeches and to create the illusion of life,” Mr. Bergen said. I tried again, face frozen like a natural, human catcher’s mask invoking humor and drama. I closed the book and pulled one of my tube socks over my scrawny arm. “Why won’t you just tell me what you want?” she pleaded. “What the hell did you say to your mother?” The streaks of yellow in my father’s eyes flashed as he struggled from his recliner like a snapping turtle trying to right itself. “He didn’t say anything,” she whimpered from the green velvet couch. He snatched the paper from her hand and read the lone word typed in the middle of the sheet. “It’s a ventriloquist dummy, John. A ten dollar ventriloquist dummy.” She pulled a handkerchief from her pocket and wiped her face. “Somebody who amuses and delights audiences around the world,” I repeated. “Because they amuse and delight audiences around the world,” I repeated. “I’m going to be a ventriloquist,” I repeated. “What are you doing in here?” my mother shuddered, wide eyes staring at her only son standing on a stool in front of the bathroom mirror with a sock on his hand. My legs trembled and my ears burned. “The change from one voice to another must be made smoothly,” Mr. Bergen reminded me. “I’m Socky,” the puppet squeaked. “I want Blabby,” I repeated. She burst into tears and slammed the door. Christmas morning I awoke at four a.m. and sneaked downstairs. Stockings sagged beneath the silver, garland-wrapped railing. Red and green lights reflected in the glass balls hanging from the Christmas tree, shimmered on the brightly colored boxes stacked neatly around its base. And sitting on the green velvet couch like a lost little boy was Blabby, his molded hair neatly parted, stuffed arms folded across his lap, waiting for his chance to speak. My eyes clouded and my throat clinched. I felt my mother’s hand on the scruff of my neck, felt her heart beating against my tiny back. We stood there, staring at our living room, staring at the cover of the Wish Book. “Thank you,” I said. Well, it should have been published, and, now it is. This is wonderful writing, James. I’ve been known to flee blogs after the first line; here I am, at the end of the post and still thinking about what you’ve written. Bravo! If I may “review” this story, I would call it, “A James Stafford.” A fan base does not necessarily correlate to good writing… but it is worth examining. Though I may read through squinted eyes, I know unspoken promises will be kept; a good story, memories examined, difficulties addressed. Always in James’ inner dialogue. Recognizable writing is surely an accomplishment, no? My friend, your writing not only absorbs some of my precious time, it also drives me to mash sausage-like thumbs into a damnable virtual mini-Chicklit keyboard. Only for you. Well done… again. I don’t think I could ask for a better review than that, my banger-fingered friend. Thank you very much. Very poignant! I had a Groucho Marx dummy. Seriously. It was cool at the time, but scared the heck out of us later! They are creepy. Granted the movies have a lot to do with that, but I think maybe it’s also the voodoo of the whole thing — animating this freaky little doll. This is my second time around with this story, and it is just as evocative as the first time. Those real family christmases lurking behind the “Real Family Christmas” facades – you nail ’em, right through glass. I am so envious of your abilities as a writer. Everything you write, I see and feel. This made me feel like crying a little…in that good way. Please never stop writing and sharing what you do. Thank you, Laura. When I wrote this in the late 1800s I thought it was a fairly strong piece. After so many rejections I just wasn’t sure anymore, so it’s nice to get it out there and get some positive feedback.